a physical method of allocating a product that is in short supply relative to demand (EXCESS DEMAND). In a free market this situation would not arise - the excess demand would be ‘choked off and additional supply encouraged by an increase in the price of the product (see EQUILIBRIUM MARKET PRICE). 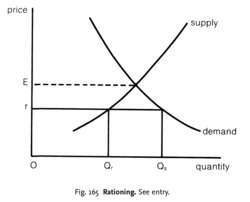 But if the price is fixed below its equilibrium rate (for example, by the government wishing to hold down the prices of key products such as food), the use of ration tickets provides one practical means of allocating the available supply between consumers on an equitable basis. In Fig. 165, for example, if the price of a product is fixed by the government at Or, then it is necessary to ration the amount of output that producers are willing to supply, OQr, at this price amongst consumers who are demanding the greater amount of OQs. See also BLACK MARKET, PRICE CONTROLS. It decided that the Federal Reserve Bank presidents should meet informally and individually with the bankers in their districts to discuss the need for credit restraint through nonprice rationing. Changes in Regulation A are intended to eliminate nonprice rationing of discount window credit. Therefore, an insufficiency of transplantable kidneys would remain, necessitating nonprice rationing.